Gary Teichmann is a former South African captain who led by example and was greatly respected by those in the game for his humility and courage. He never captained a side at school level but once he started playing for Natal his coach Ian McIntosh realised Teichmann's potential as a captain and pushed him into it. Under his leadership, Natal won three Currie Cups and they reached the Super 10 final in 1994. Four years later he led the Sharks to the final of the Super 12. In 1995 his performances for Natal earned him a Test call-up and he made his Test debut against Wales marking the occasion with a try in a 40-11 win. The Springboks won 26 of the 36 matches when he led the side and they also went onto win a record-breaking 17 matches in a succession but he led the Springboks to a surprise series defeat in 1997 when the World Champions lost to the British & Irish Lions 2-1. 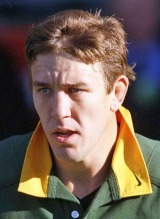 In 1999 the new South African coach Nick Mallett sacked Teichmann as captain due to his loss of form, which was a decision Mallett later admitted he got wrong. Teichmann's last game was in a 28-0 defeat to New Zealand in Dunedin and it meant he would never represent his country at a World Cup. The decision to sack Teichmann was a controversial one and there was much talk about it in the media but he steered clear of it and decided to do his talking on the pitch with his new club, Newport. In his last game before retirement he helped the club win their first piece of silverware in 24 years when they beat Neath in the Principality Cup. Welsh journalist Stephen Jones wrote about Teichmann's retirement saying," when you strike gold with the likes of Teichmann, the benefits are vast. The leadership he has shown and the example he had set has been the perfect tutorial for the young men around him." Since his retirement he has served in an advisory capacity for the Sharks.